Tjipetir mystery: Why are rubber-like blocks washing up on beaches? For the past few years, 100-year-old rubber-like blocks from Indonesia have been mysteriously washing up on beaches in the UK and northern Europe. The Titanic has been suggested as one of the possible sources - but now a beachcomber says she may have solved the puzzle of the Tjipetir blocks. In the summer of 2012, Tracey Williams was walking her dog along a beach near her home in Newquay, Cornwall, when she spotted a black tablet on the sand, made of something resembling rubber. It looked like a large chopping board and the word "Tjipetir" was engraved into it. Weeks later, she found another such curiosity on a different beach alongside bales of rubber, washed up in a cove. Her curiosity piqued, she began to research the origins of these mysterious blocks. What she learned included stories of shipwrecks, an infamous World War One tragedy and the Titanic. It also transpired that these blocks had been appearing on beaches across northern Europe, baffling everyone who had found them. There has been speculation in the press as to the source of the washed-up blocks, with the Daily Mail and the Times recently running articles. The French press covered the story in April also. But Williams believes she has worked out the source of the mystery - and it matches what the UK authorities think too. The word Tjipetir turned out to be that of a rubber plantation in West Java, Indonesia, which operated in the late 19th and early 20th centuries. The blocks were not strictly rubber - they are most likely gutta-percha, the gum of a tree found in the Malay Peninsula and Malaysia. It was used in the 19th and first half of the 20th centuries to insulate telegraph cables on the seabed. Before modern plastic began to be widely used, gutta-percha was also made into such items as golf balls, teddy bear noses, picture frames and jewellery, among many others. Williams began charting her progress on a Facebook page, which led to many people coming forward to reveal their own gutta-percha finds, often made when they were cleaning their local beach. These were not only around England and Wales but also in Shetland, the Channel Islands, Spain, France, the Netherlands, Germany, Norway, Sweden and Denmark. Along with these blocks, bales and rolls of rubber are also being washed up. There has been speculation that the gutta-percha could be coming from the wreck of the Titanic. "A French newspaper covered the story and reported that the Titanic had been carrying gutta-percha," Williams said. "I checked the ship's manifest and discovered that it had indeed been carrying gutta-percha and bales of rubber. There was much wild press speculation about this afterwards." Then, in the summer of 2013, Williams had a breakthrough. She was contacted separately by two people - who did not want to be named - and both pinpointed one wreck as the source. They knew of a salvage company carrying out recovery of cargo from Japanese liner the Miyazaki Maru, which had sunk during World War One. It had been carrying the Tjipetir blocks. It sank 150 miles (241.5km) west of the Isles of Scilly. "I was told that when salvage work is done, the cargo they are looking for is pulled out in large amounts, and the gutta-percha and rubber bales have been released from the ship's hold as a result," Williams said. "So both my sources told me that shipwreck is where those items are mainly coming from. I've been shown evidence supporting this." But Williams isn't the only person who thinks the gutta-percha is coming from the Miyazaki Maru. The government's Receiver of Wreck, Alison Kentuck, the official who administers wreck and salvage laws within UK territorial waters, also says it is most likely the blocks are indeed cargo from that ship. "When we are made aware of wreckage we conduct research to find the owner," she said. "We look at the age of the items, where they could have come from and examine any markings. "Our findings with these particular items pointed towards that particular wreck. So although we have not confirmed it, the Miyazaki Maru is our favoured possibility as the source of the washed-up blocks." The Miyazaki Maru was sunk by a German submarine, U-88, captained by Walther Schwieger, one of Germany's most successful U-boat aces. Schwieger was also in charge of another German U-boat which, in May 1915, sank the RMS Lusitania, a liner bound for Liverpool, carrying 1,924 passengers and crew from New York. That notorious event led to more than 1,100 deaths, including more than 100 Americans and is thought to have hastened the US's entry into the war. 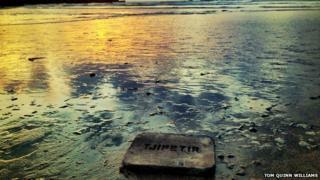 Oceanographer Curtis Ebbesmeyer, who specialises in tracking flotsam, says the Tjipetir blocks may be washing up on beaches for centuries. "Based on the findings so far, they are clearly being fed into the hemispheric ocean circulation. It only takes 25 years for flotsam to go around the world, and they've probably been around long enough to go around the world three times. "They're still in good condition after all these years, which is unusual. They're probably one of the great pieces of flotsam that people may be finding 100 years from now." Ebbesmeyer also said various gyres - or ocean currents - may pull the blocks from Spain across to the Americas "mirroring the same route that Columbus took" before possibly ending up in Florida. The ones found in the North Sea "should go up past Norway, turn east past the top of Siberia, go through the Bering Strait into the North Pacific and go all over from there". Several people have also reported finding Tjipetir blocks back in 2008, before the current salvage operation is thought to have begun on the Miyazaki Maru. One person has come forward to say they found a block more than 30 years ago and used it as a chopping board to gut fish on their fishing boat. "Many ships would have been carrying gutta-percha, so it's possible that the cargo is coming from more than one source," says Williams, who is writing a book about the Tjipetir story. "It is being seen as pollution - and I clean debris from my local beaches all the time - but the gutta-percha is a natural product, so it does degrade. I've seen disintegrated blocks on the beach." "Perhaps other companies are salvaging material from World War One wrecks too. It is possible that some of it is from the Titanic? I don't know."